Het Residentiekoor was founded in 1936. At the moment, the choir consists of approximately 60 enthusiastic members. Het Residentiekoor distinguishes itself by the varied and challenging repertoire. In the past we performed works from, amongst others, Bach, Pärt, Mendelsohn, Poulenc, Bernstein, Händel, and Karl Jenkins. Het Residentiekoor does not shun away from contemporary music and participated in the world premiere of "Glorious", a masterpiece by the Dutch composer Jaap Geraerdts. Our conductor is Martin van der Brugge. We presented the second performance of "The Armed Man" by Karl Jenkins in the Netherlands in 2006 within the scope of our 70th anniversary. On Sunday November 30, 2014, we performed this piece again to commemorate World War I, which began on July 28, 1914 and ended November 11, 1918. During our rehearsals a professional pianist, Laura Sandee, accompanies the singers. At least once a year we give a public concert in The Hague and on that occasion we are most of the time accompanied by a professional orchestra. If you are interested in joining our choir, or would like to have a taste of the atmosphere, you are warmly invited to join us during our rehearsals. Het Residentiekoor is rehearsing every Thursday evening from 20:00 - 22:15 at the grammar school 'Hofstad Lyceum'. 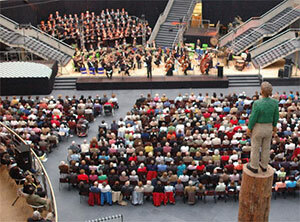 The Hofstad Lyceum is situated at Colijnplein 9 in The Hague, nearby the shopping mall Savornin Lohmanplein. Looking forward to meeting you on one of our rehearsals or concerts!